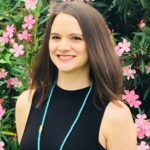 We met with Erica Ayers, the School Health Coordinator for the South Carolina Department of Health and Environmental Control, to learn more about her training experience. I worked with Rahim El-Amin, the district’s PE coordinator and an assistant principal; Chelsee Shortt, a Physical Education doctoral student at University of South Carolina; and Lynn Hammond, the South Carolina FitnessGram Coordinator and our state’s Presidential Youth Fitness Program trainer. Mr. El-Amin had the ability to get administrative and staff buy-in and coordinate the day. When working with a school district, it sometimes takes a while to find the right contact for what you want to do. In this case, Mr. El-Amin was that person. It took one phone call. He got excited and scheduled it right away. Chelsee brought her ability to take the topic and put together a fitness progression lesson plan. Lynn made the connection between CSPAP and FitnessGram and how to use the fitness data to help students meet their goals. She is great at promoting the message of CSPAP. From Chelsee, I learned that PhD students are great to involve because they are interested and need the contact hours. I learned that Mr. El-Amin had a PE background and is very passionate about physical activity. At first, I thought PE was just one of the many hats he wears, but he has a background in it and can advocate for it at the district level. I have learned from my experience training PE teachers that they are PE teachers for a reason -they do not want to sit still! PE teachers want to do real physical activity. For a full day workshop, I had them in the gym for half the day. It provided the participants a safe place to share their concerns, challenges, and frustrations, but also brag on their successes and talk about their lessons learned. It was the first time they had been brought together that school year, and the training gave them the chance to learn together. 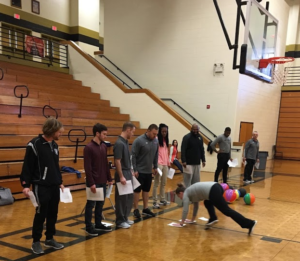 For example, we talked about state PE standards, and this training gave them a chance to talk about how they are meeting the standards at each level. This discussion gave them a full picture of what everyone is doing at each level, so the middle school teachers could build on what is going on in elementary classes and high school could build on what is happening in middle and elementary classes. Because it was the CSPAP training, we talked about opportunities for physical activity outside the physical education class. I found that encouraging them, motivating them, and giving them the tools to be physical activity advocates and content experts in their schools is a challenge. 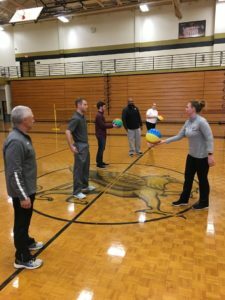 They were unsure of how to work with classroom teachers on physical activity outside of a physical education class, because they view themselves as being underappreciated. Helping them understand how to break down that silo and be an advocate is a challenge. We did the Vote with Your Feet activity, which is a great way to spark conversations. I asked them if they agreed or disagreed with the statement, “in your school/district, PE is as highly regarded as other subject areas.” They talked about how PE teachers need to work hard to improve the image of PE, and they recognized the fact that they have to become advocates in their own schools. 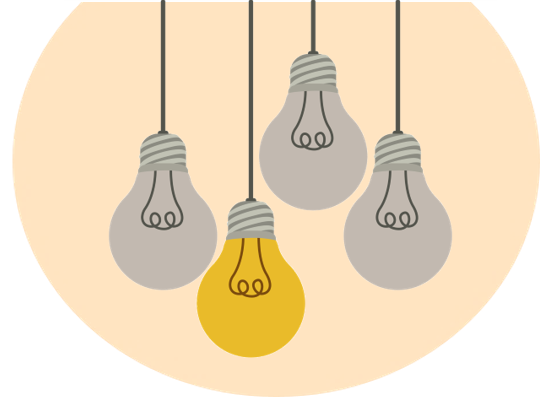 Something you wish you knew before you conducted your first training: You don’t have to fit everything into one workshop. Favorite thing you’ve ever learned from a training participant: Teachers teach for the kids. Center your training around the whole child and they’ll be engaged. Best a-ha moment you’ve had as a trainer: With full day workshops, go out to lunch together. Your training style in three words: Sit on desk. I try to keep it as informal as possible, so when we go down the road of having great conversations, I sit on a desk and join in the conversation. I am the only person in the room who knows the script. If I mess up, nobody knows!